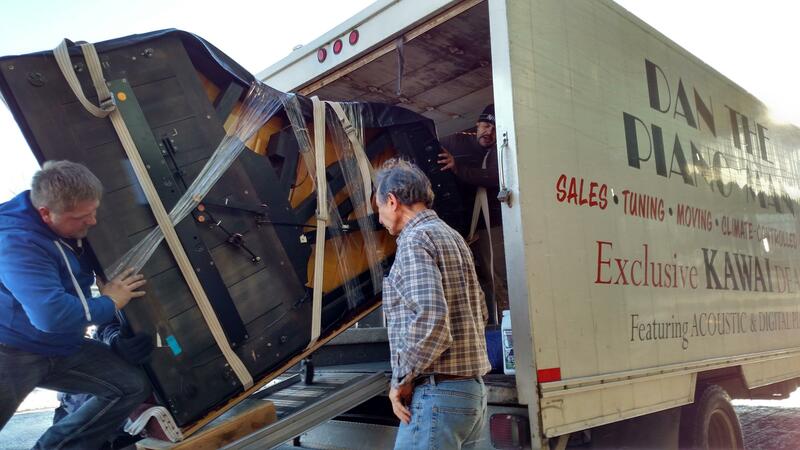 Dan the Piano Man moves the SPR Performance Studio Piano from the second floor of the Hoban Building. The largest and most crucial stage of moving the stations of SPR to Fire Station No. 3 began on Tuesday afternoon, January 12. The most noticible sign? KPBX programs were heard on all three SPR stations. See the KPBX schedule here. KSFC and KPBZ stations dropped their unique programming for the time being. "Our computer system is getting unplugged, packed up, and on the truck south," Program Director Verne Windham said. "Without that system, we're running radio the old fashioned way and we can only keep up one station's sound." The simulcasting should continue for the rest of the week. Moving this amount of delicate equipment isn't fast or easy, as decades of wires are carefully dealt with. SPR has been grateful for listeners' patience so far. As Murphy's Law cautions, "If anything can go wrong, it will.” Even though SPR had contingency plans at several stages through construction and the move, obstacles still popped up in unexpected places. Funding for much-needed new equipment fell short as our efforts to land several large equipment grants have not all proven successful. The windstorm took out four of the five days of the Fall Fund drive to sustain operations. And we’ve experienced any number of technical delays, such as trying to mount and aim antennas during snow storms or heavy fog, which amounts to slow going and very restricted access to transmitter sites. We've been able to move forward by repurposing old equipment, but that has caused delays and now the lack of KSFC programs or Radio Remix on KPBZ. As soon as the computer system that manages station programming is in place, SPR expects to be fully operational. We plan to complete the move in time for our celebration of 36 years of broadcasting. We've scheduled a Grand Opening of the “new” Fire Station No. 3 facility at 1229 N. Monroe in Spokane on Saturday, Jan. 23. "Considering where we were a year ago, the progress is astounding," says General Manager Cary Boyce. "This is the beginning of a new era of public radio service. It’s thanks to the generosity and vision of our listeners and donors. The last few yards of this effort have been difficult, and we still need to replace some necessary equipment over time. But we’re almost home."